Leo I: a dwarf spheroidal galaxy that is a remote satellite of the Milky Way. Image: Sloan Digital Sky Survey. 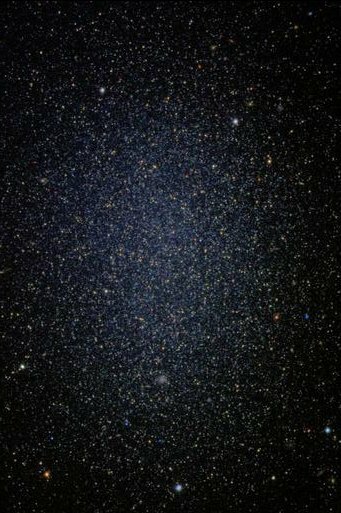 A dwarf spheroidal galaxy is a low-luminosity (less than absolute visual magnitude -14), low-surface-brightness dwarf elliptical galaxy of near-spherical shape that lacks a nucleus. Although often thought in the past to be merely large, low-density globular clusters, recent studies have shown that dwarf spheroidal (dSph) galaxies have a more complex stellar population than that found in globulars. Most importantly, dwarf spheroidals show evidence for star formation over extended periods, even though they show no sign of current or recent star formation and have no detectable interstellar matter. 1. An old metal-poor population similar to that of globular clusters. 2. An intermediate-age population, whose ages range from one to 10 billion years. The mass-to-light ratios of dSph's is also higher than that of globular clusters, indicating that these galaxies contain a significant amount of dark matter. In the Local Group, 22 dwarf spheroidals are known including 12 that are satellites of the Milky Way Galaxy and a further 7 that are satellites of the Andromeda Galaxy. Some recent estimates suggest that these nearby dSph's have a dark matter content within the sphere of visible stars of about 4–5 × 107 [see refs 1, 2]. They may also have a large dark halo that extends well beyond the luminous volume. Their luminous mass content (i.e. total stellar mass) appears to be typically in the range 107–108 solar masses. 1. Wilkinson, Mark I., Kleyna, Jan, T., et al. "Probing the dark matter content of Local group dwarf spheroidal galaxies with FLAMES." Jun 2006. On-line paper in PDF (European Southern Observatory). 2. Biermann, Peter, L. and Munyaneza, Faustin. "The Nature of Dark Matter." To be published in Proceedings of the International School of Astrophysics at Ultra-high Energies, 20-27 June 2006, Erice, Sicily, Italy. Report-no: MPIFR-BM/0207.